For years, Nancy Landa has maintained a blog called “MundoCitizen.” The bilingual title —mundo is Spanish for “world” — captures the spirit of her work, as Landa’s life has been spent between borders. Born in Mexico, she was brought to the United States by her family when she was young, and then spent years in the United States going to school, working, and trying to attain her U.S. citizenship. That was eight years ago, before she was finally deported while heading to work, joining an ever-growing group of young Mexican nationals who are culturally completely American. 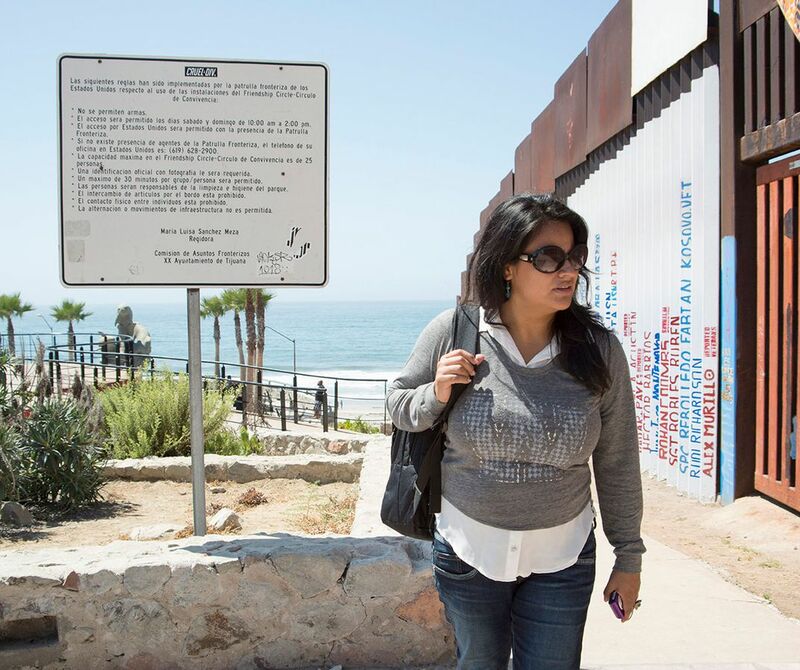 Since her deportation, Landa has received a master’s degree in global migration from University College London and become a migration policy expert. She is currently living in Tijuana, Mexico, and leading Mundo Translated, a firm that conducts research on immigration issues. Landa spoke to Smithsonian Second Opinion about her own immigrant experience and how that affects her policy work today. This interview has been condensed and edited for clarity. My concept of citizenship goes beyond what I think most people understand in terms of being born in a country and having that certain nationality. Because of my own migration experience, I sort of redefine what it means for me to be a citizen, or for me to be a Mexican, or for me to be an American. For me, it’s a place of belonging and roots and a sense of community, which goes beyond papers. For me, the fact that I lived 20 years in the United States — I arrived there as a child, grew up there and participated as a citizen, trying to make a difference, help others, trying to just contribute to my community — that, to me, is citizenship. It’s not conditional on legality, or the place I was born. Returning to Mexico made me question that aspect, because I think most people conflate citizenship with national identity, and I think that migrants offer a different perspective. Sometimes you’re displaced, or you grow up somewhere else from your place of origin, so you sort of redefine where you belong. It gives you the opportunity to adapt yourself, or root yourself somewhere else. What does being an immigrant mean to you? There’s a lot of conversation right now about certain kinds of immigrants. I just want this disclaimer, I guess — I try to make sure people understand my experience as my experience, and perhaps something that’s shared with many other immigrants, but I wouldn’t say it’s the immigrant experience. There’s different lived experiences of what it is to be a migrant. In my particular case, living in a context in which there were very few options for social and economic mobility for my family — I come from a poor family who had very little access to education in Mexico, at a time when economically there weren’t a lot of opportunities for people in my social class and my parents’ social class, and things were getting worse — your only survival strategy is really migration. In my particular case, I didn’t engage in making a decision. I was too young to really have that sort of agency, to make that decision. We ended up migrating to the U.S.
Folks like us, we don’t qualify for immigrant visas. I do remember my parents applying for that, but there aren’t any legal channels for people to just apply, pay your fee or whatever, and emigrate to legally work. I think that’s one thing that people don’t understand. It’s not a thing about just making a line and knocking on the door and there you go, here’s your paperwork to work. There’s limited channels to be able to do that. So that was the case for my family. How does your experience inform your studies and what you do now? I’m working on irregular migration to the region, and also return migration because that’s my own personal experience, and what I see as forced displacement because of deportations as a phenomenon. My approach to research has been advocacy, in a way; my belief is that to understand the issue, you have to understand the migrant experience, and realize how immigration policy affects people. For me, that’s been an important, central part of placing my own experience but also how I see that experience lived through other people that I’ve met in the U.S., Mexico and in other parts of the world. Thankfully, I’ve been able to travel a bit and collaborate with and get a perspective from people outside the region, and that’s also been helpful for me. When you think about it in terms of identity, because part of citizenship is how you describe your identity, that has been fluid for anybody who has navigated different spaces, different communities. For me, as I grew up — as I lived in a multicultural environment, as I created a sense of home in the United States and now I am back — it’s been a fluid thing. Sometimes it’s one of those things that you define for yourself, but other people have other perceptions of who you are, based on how you look, how you speak, how you behave. That’s a problematic aspect sometimes — how you define yourself is not really how other people perceive you, and so engaging them in conversations for me, that’s why it’s been really interesting to start questioning peoples’ beliefs, especially those who define nationality or citizenship in a certain way. It’s more complex than most people understand, and I feel that people who haven’t migrated, who haven’t looked at the complexities of belonging and identity, have a hard time seeing a different point of view about it. How have your experiences affected how you see the immigration debate in the United States? My identity was really forged in the U.S. But as you grow up and realize the consequences, or the effect of being an undocumented migrant, you face an uphill battle of trying to figure out how do you find out a way to fix that? And then you realize there aren’t really any legal channels for you to change that. Generally people have this misconception that if you’re in the U.S. 10, 15, 20 years, then it’s your fault that you didn’t fix your papers, or that you should have fixed it at some point. I like to highlight the fact that that shows the ignorance of people in society about immigration policy and about how for 20 years someone could live without being able to change that situation. That was the case for us — we just never really qualified for anything. We arrived after the amnesty in the 1980s that President Ronald Reagan allowed. After that it’s been a restrictionist policy, and so we just never had a legal channel. I never had kids, we never had immediate relatives who were citizens or legal relatives, so that just closed any door for me to fix that. It’s the problem that really defined my life, that I could live with fear or feeling that I had to hide that aspect of myself to be able to survive and navigate my life as an adult, going to college and figuring out how I was going to work… so that situation, laid on with time, became problematic for us, and sort of led to our deportation 20 years later. And then arriving in Mexico abruptly, and the way we were expelled, made it tremendously difficult to settle back in our country of origin. So that’s been my struggle for the past eight years. It’s really easy for policymakers and everyone else who wants to contribute to the debate to have very distorted views of what it is to be an immigrant. Obviously, in this political environment, it’s become conflated with criminality. I know that’s not the case. The migrant experience is a lot more complicated, a lot more human, a construct that reflects socioeconomic and political conditions that make a lot of people vulnerable and subject to attacks by governments. It’s xenophobia that I think is driving that discussion in the United States. It’s uncritical to say, “Well you were illegal therefore it’s okay to receive this treatment,” without realizing that legality is something that governments have constructed on whatever’s convenient to them. I believe the economic model that we have, not only in the U.S. but also in Mexico, having people under “illegality” or “illegalizing” them is very convenient economically. You can exploit them when it’s convenient to you, and you can dispose of them when it’s convenient to you. What about the discussion around DACA, the Deferred Action for Childhood Arrivals act, and the push to make them “good immigrants” in the national debate? I don’t think the argument for human rights should be based on their contributions. We need to see immigrants as human, and if we talk about human rights, not only in the national context but regional and international contexts, there’s a whole debate we should be having about how they’re treated by governments. I feel that immigrants really need to be discussed, through the voice and the experience of people that have very diverse and very complex experiences. That has not been understood in the way it’s seen and lived and practiced. The immigrant construct, or how people view immigrants, is far from reality, and really distorted, and it really worries me, how governments and the public discourse has defined what it is to be an immigrant. I find that to be a complete fabrication and a complete distortion of what I know of immigrants.